California is full of delightful geological surprises. 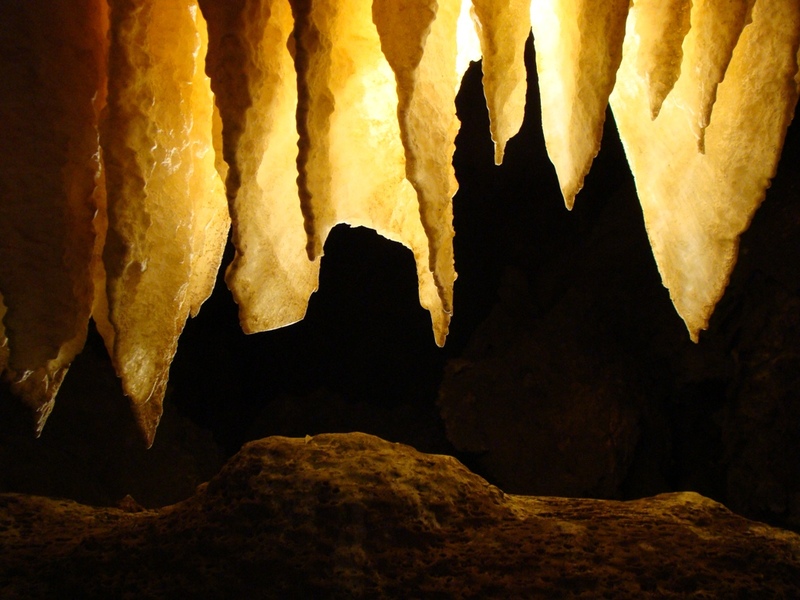 Mention "caverns" and most Americans will think of places like Mammoth Cave, Kentucky, or Carlsbad Caverns in New Mexico. 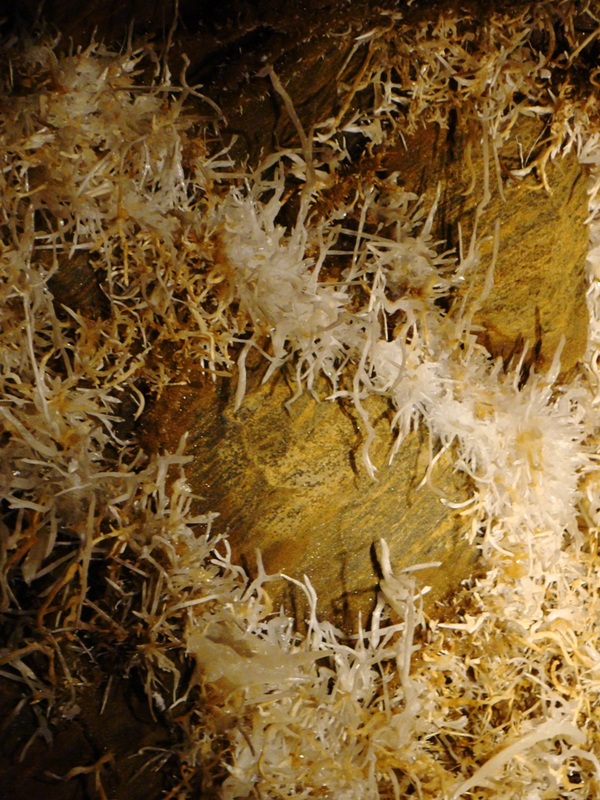 Not too many people will think of California, but California does have an unexpected number of world-class cavern systems. 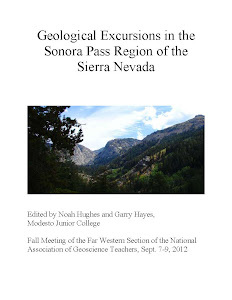 The state has such a complex geologic history involving granite intrusions, volcanic eruptions and earthquakes that it is easy to forget that for vast stretches of geologic time, California was stunningly boring passive continental margin. In Paleozoic time, the region was a shallow sea, slowly collecting mud and lime deposits in a tropical environment. In some cases, the tropical islands and shorelines were elsewhere, but the rocks were transported to California on the giant conveyor belt of the Pacific and Farallon tectonic plates. As the Farallon plate was subducted beneath the continental margin, the limestone sequences were scraped off and added to the metamorphic sequences of the western Cordillera. The limestone was baked and transformed into marble, and a great deal of marble was preserved in a tract of crust (or terrane) in the western Sierra Nevada Metamorphic Belt called the Calaveras Complex. 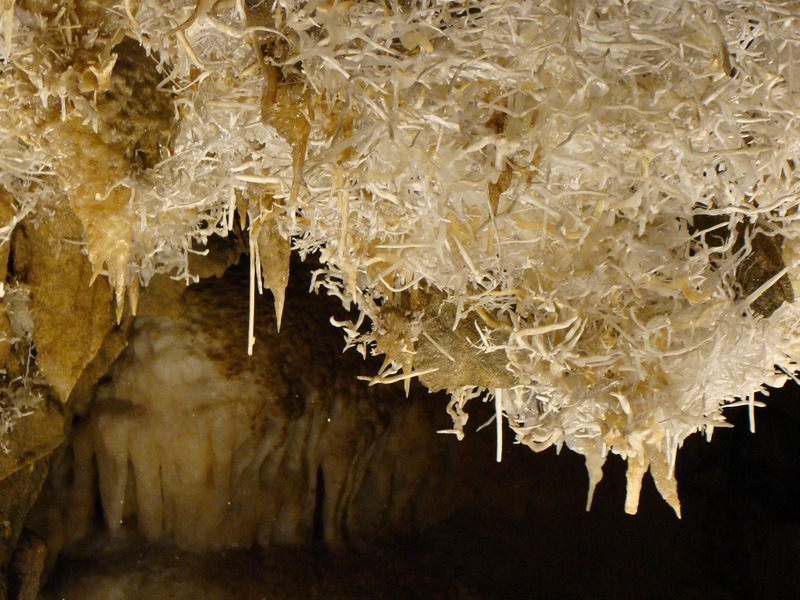 The Calaveras hosts many of the caverns found in the state; there are hundreds of them. Unless I lost count somewhere along the line, six caverns in the Sierra Nevada have been developed for public tours: Crystal Cave in Sequoia National Park, Boyden Cave in Kings Canyon, and four caves in the Mother Lode: Moaning Cave, Mercer Cavern, California Caverns, and today's destination, Black Chasm Cavern. I was at Black Chasm yesterday with twenty of my students, on a field studies trip through a portion of the Mother Lode. 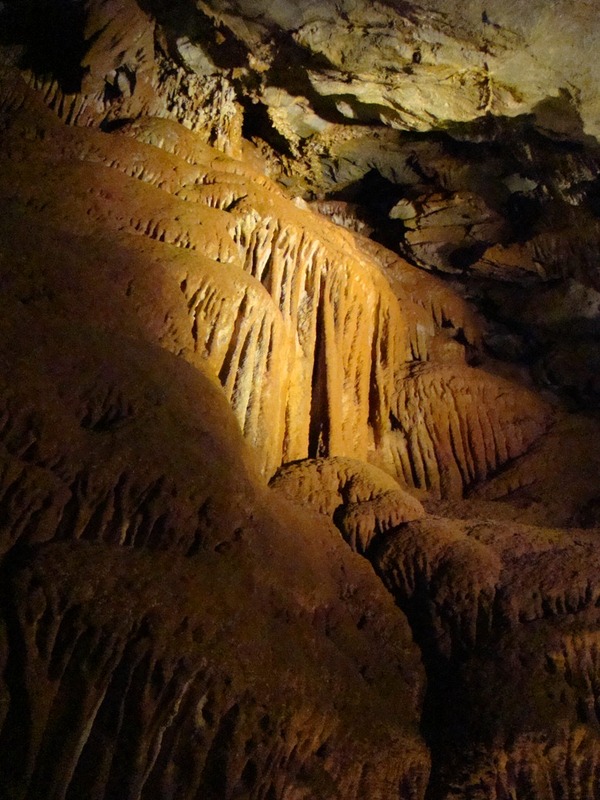 The cave is privately owned, but it has been granted National Landmark Status, a designation that recognizes the geologic or historic importance of the cave, and encourages the preservation of the feature. The owners have done an good job at Black Chasm. It is one of the best places I know of that gives the casual visitor the experience of seeing a cave that is close to pristine condition, much as when it was first discovered. 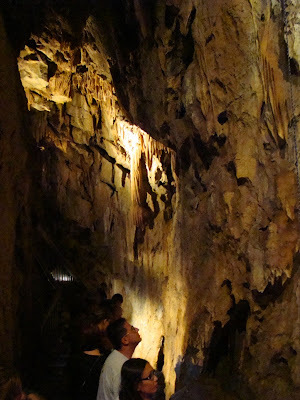 The problem is that many Sierra caves were discovered by miners in the 1850s, and they became well-known and well-visited. It was not at all unusual for the cave owners to encourage their visitors to take a stalactite as a memento of their visit, and the caves were stripped of their decorations (speleothems would be the proper term for the stalactites and other features of caves). 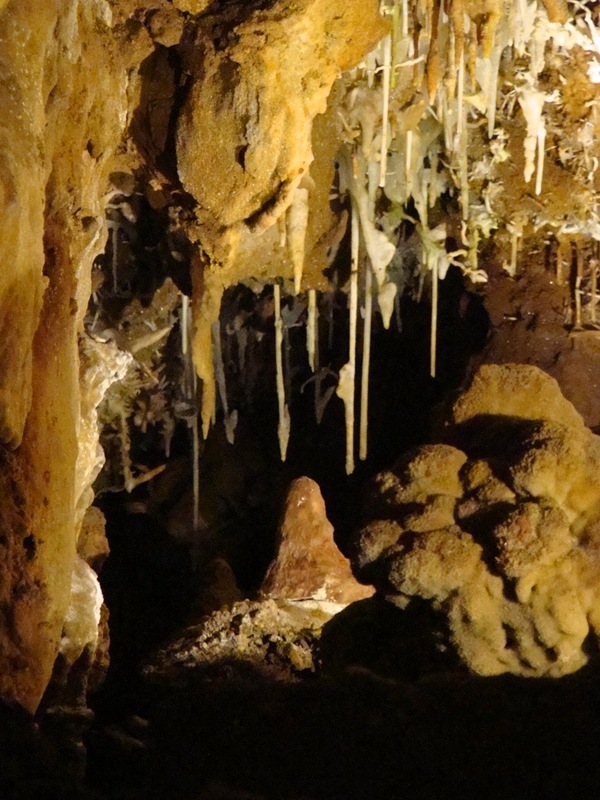 The early explorers often used torches for light, and the soot left its mark on the remaining speleothems. Black Chasm was discovered early on, but it was the cave's namesake that protected it from the worst damage. 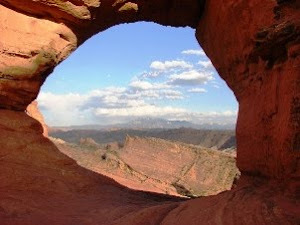 The entrance into the cave is very steep, and after clambering down the steep slope, probably hanging onto a rope, the early visitors passed through one interesting room, but then found themselves perched on the brink of an eighty foot cliff that ended in the darkness below. Without technical equipment there was no going forward or going down. The interior passages of the cave were protected from vandals by inaccessibility. 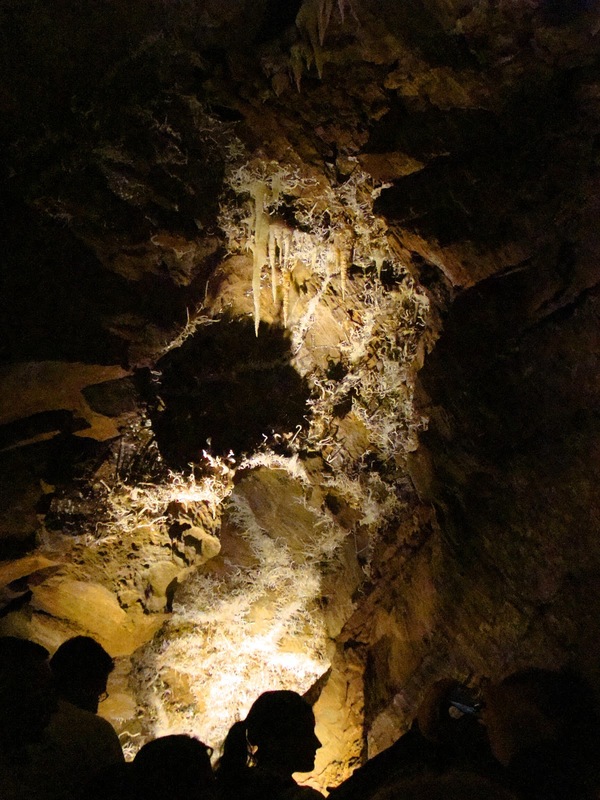 When the owners of Black Chasm decided to open the cave for tourism, they constructed a walkway that clings to the wall of the Black Chasm and passes into the rooms beyond. The contrast between the first room of the cave and the last room is striking. 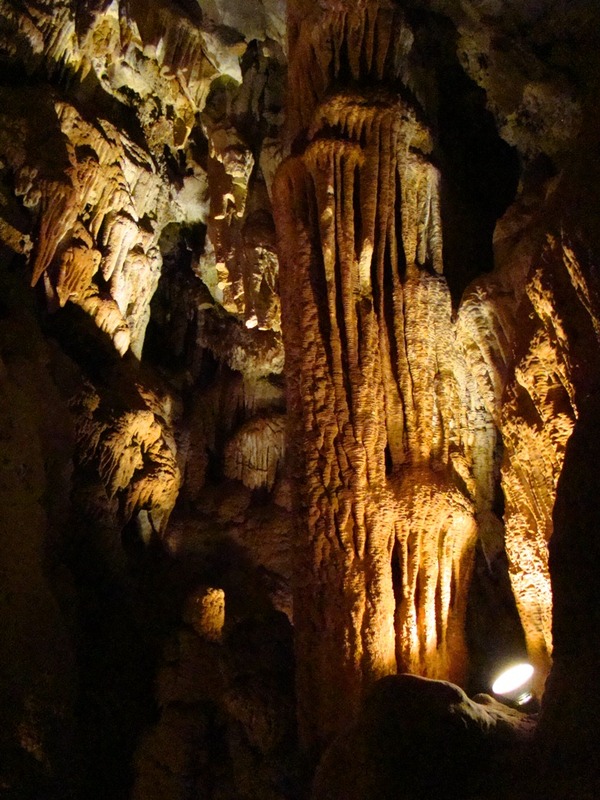 Many of the stalactites and other speleothems are broken off, and the remaining ones have a patina of orange-red mud that comes from seepage of iron oxides from soils above, but also from soot and dirt from the early visitors. The room is still pretty, but not exceptional to anyone who has visited other caverns. And then you start to see what an undamaged and pristine cave is really like...the parallel fins are referred to as cave bacon. 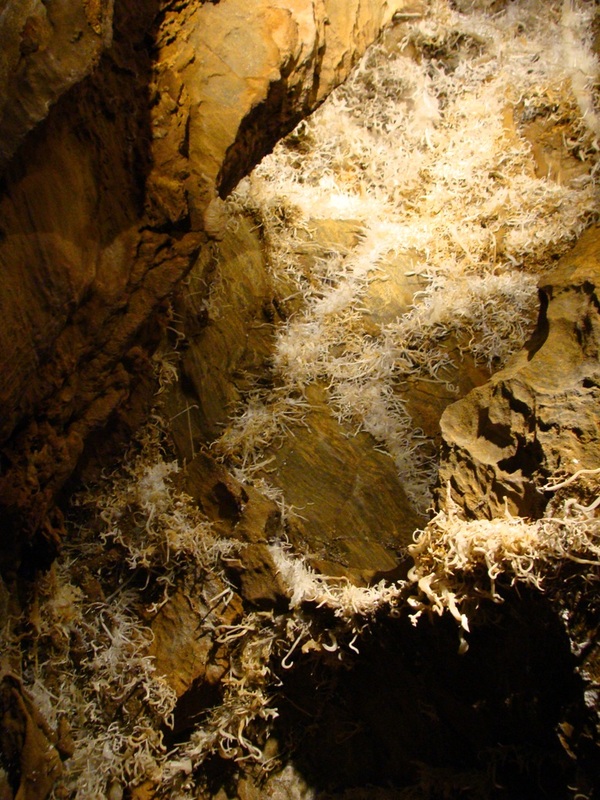 The cavern has some nice examples of soda straws (above), which are very thin stalactites that are among the first speleothems to disappear in unprotected caverns. One touch would be enough to break them off. 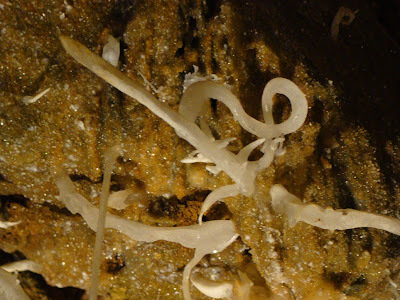 I've seen some in Kartchner Cavern in Arizona that broke off without being even touched. The just broke off, maybe from something as weak as wind currents or the shaking of a distant earthquake (the effects of quakes are muted in caves, as they are much less affected by surface wave shaking). The draperies in the far room of the tour are nothing short of fantastic. The lighting is nicely placed to allow for back-lighting. Flash photography from handheld cameras almost never works in caverns. The flash washes out any contrasts in color, and without shadows, the features lack depth. I get a lot of non-flash pictures that I have to delete because I shake too much, but the few I get with the back-lighting are far more satisfying. The final room of the tour is exceptional because of one particular kind of speleothem: helictites. Helictites can be characterized as stalactites that refuse to recognize the law of gravity, or by some descriptions, stalactites on acid. They have grown in random directions, perhaps because the water that formed them was driven as much by capillary action as it was by gravity. Up closer, the fuzz resolves into thousands of individual helictites. The complexity of the helictites is just stunning. I never get tired of trying to get another shot. Shawndee, the manager at the cave, probably thinks I'm ignoring her while she is talking to my students, but I do listen. I'm just multitasking, trying to get the perfect shot! I always see something new whenever I go into Black Chasm. 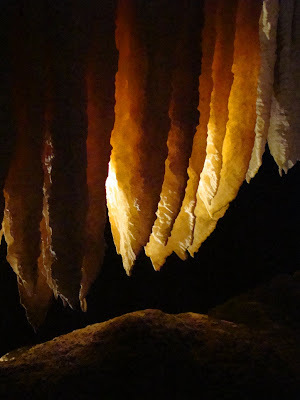 This time it was the dogtooth spar crystals in an obscure cavity along the walkway. 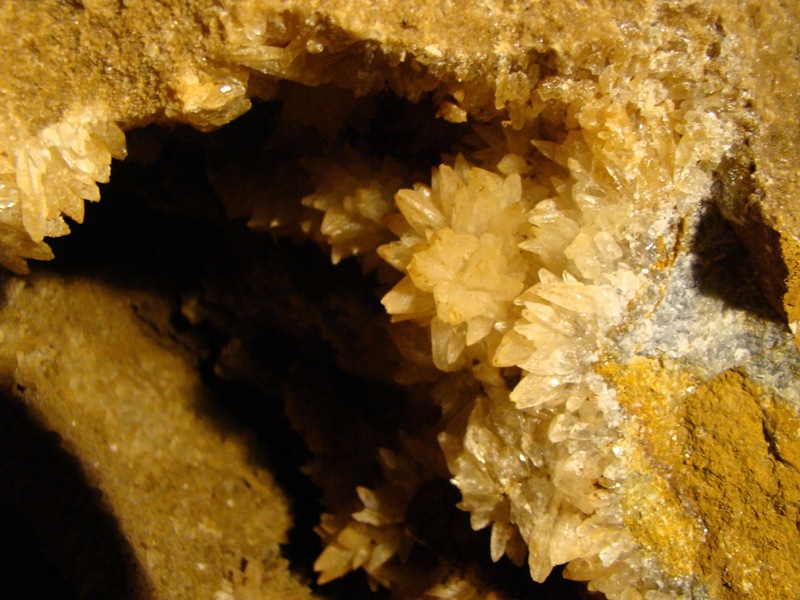 Dogtooth spar is a crystal form of calcite, which along with aragonite is the mineral that makes up most of the speleothems in the cave. 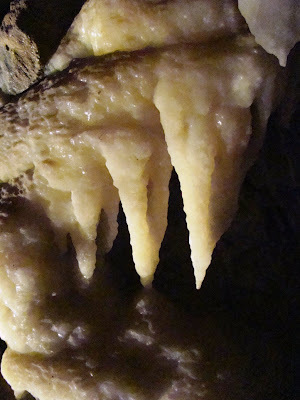 So, I hear that the old terms Stalagtite/Stalagmite are wrong; They've been replaced by speleotheme, or sumat sim'lar. Is this true? If it is, why not use words with mnemonics built right in? -tite holds tight to the ceiling, -mite stands tall and mighty on the floor. Nothing has changed; you can still call them as you see them. "Speleothem" is to stalactite and stalagmite as "furniture" is to couch and chair. 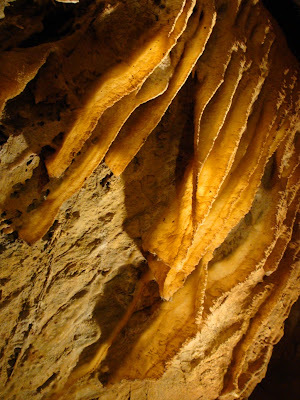 It is an overall term for all of the features found in caves. Thanks, Garry. For some reason I always parsed the use of speleothem as a correction of some sort. Appreciate the information. Gorgeous cave. Always nice to visit one that hasn't been heavily vandalized. I haven't been to any of the Sierra caves but the images of wavy graphite in the marble fascinates me. Oregon Caves, where I once worked, is a block of marble broken off the Sierra.